An interactive installation by Oana Suteu Khintirian and Navid Navab. Threads is exploring new haptic ways of engaging with paper. Dwelling with the mnemonic dimension of the written word, it puts under the magnifying glass the acts of reading and writing in an intricate play of sensorial relations. Drop-spindles suspended in mid-air hold threads made out of hand-written paper coming from a century old correspondence. When touched, they produce gesturally modulated sounds that combine to create a mesmerizing environment. On a desk one can find a letter size paper sheet and is invited to reconsider the act of writing, by the use of inkless pen and sonified paper. Oana’s work encompasses films, multi-channel video installations, media scenography and, more recently, interactivity. It focuses on movement as well as on the human body and its correlation with the environmental elements, structures and dynamics. 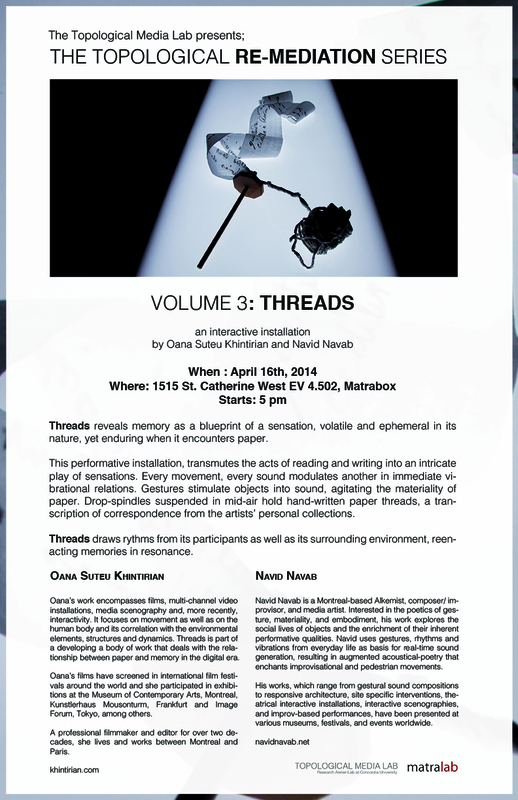 Threads is part of a developing a body of work that deals with the relationship between paper and memory in the digital era. Oana’s films have screened in international film festivals around the world and she participated in exhibitions at the Museum of Contemporary Arts, Montreal, Kunstlerhaus Mousonturm, Frankfurt and Image Forum, Tokyo, among others. A professional filmmaker and editor for over two decades, she lives and works between Montreal and Paris. Navid Navab is a Montreal-based Alkemist, composer/improvisor, and media artist. Interested in the poetics of gesture, materiality, and embodiment, his work explores the social lives of objects and the enrichment of their inherent performative qualities. Navid uses gestures, rhythms and vibrations from everyday life as basis for real-time sound generation, resulting in augmented acoustical-poetry that enchants improvisational and pedestrian movements. His works, which range from gestural sound compositions to responsive architecture, site specific interventions, theatrical interactive installations, interactive scenographies, and improv-based performances, have been presented at various museums, festivals, and events worldwide.